I’m back with the recipe from yesterday’s baking overload session. It might have looked like a lot of fun, but baking 5 loaves of bread at home, after already baking for 6 hours straight at the bakery that morning made it a bit of an overkill. Why did I do this to myself? Well…I promised my mom that I would bake homemade loaves of banana & pumpkin bread to give out as gifts to her fellow teachers for the holidays. Despite the large quantity requested, I was able to whip them out pretty quickly. 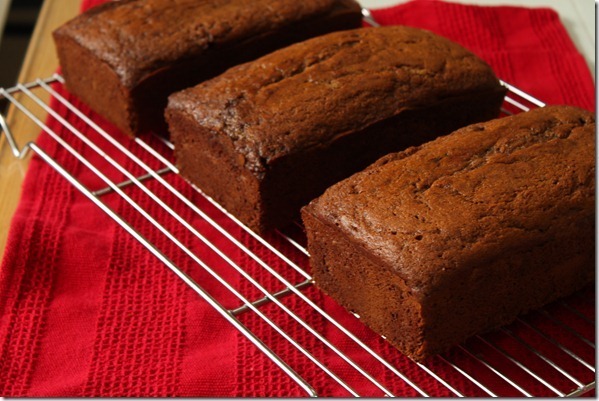 For one, I tripled our family recipe for pumpkin bread (will share that recipe in the future!) and doubled the recipe for banana bread. I baked them all in loaf pans resting on a baking sheet, which helps even out the baking, and was able to put them all in the oven. To help, I rotated the pan 180 degrees halfway through the baking process to ensure that they all turned out more or less the same. This is my go-to banana bread recipe. It is simple, straight-forward, and delicious. Many of the ingredients you’ll already have right in your pantry and you could easily increase the spice quantities or add a dose of chocolate chips (add a teaspoon of the dry ingredients to the chocolate chips to ensure they don’t sink in the batter) to bring it up a notch. However, it is perfect just the way it is, with bananas being the first thing you taste as you sink your teeth into this moist bread. 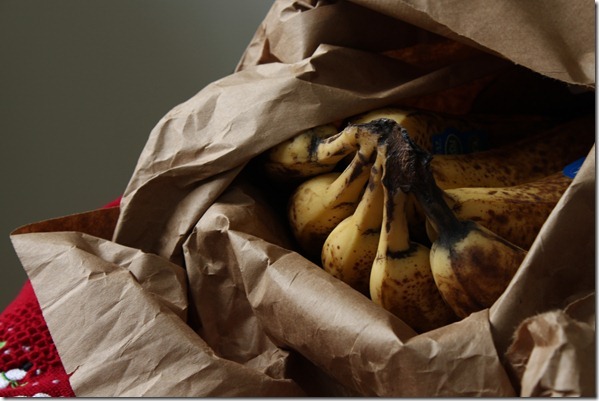 If you don’t have any ripe bananas on hand, buy as ripe as possible at the store and place them in a brown bag in your kitchen. They’ll become ripe incredibly quickly. This tip also works for avocadoes! 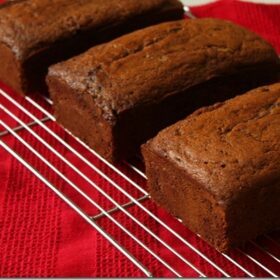 Another option is to freeze extra-ripened bananas in the freezer and defrost them just before you make this bread. Preheat the oven to 350 degrees Fahreneheit and grease a 9 inch x 5 inch loaf pan. In a medium bowl, whisk together the dry ingredients and set aside. Melt the butter in the microwave (in 30 second intervals) and combine with the granulated and dark brown sugar in the bowl of stand mixer, fitted with a paddle attachment. Mix on medium speed until well combined. On medium speed, add the eggs one at a time. Add the mashed banana and mix until incorporated. 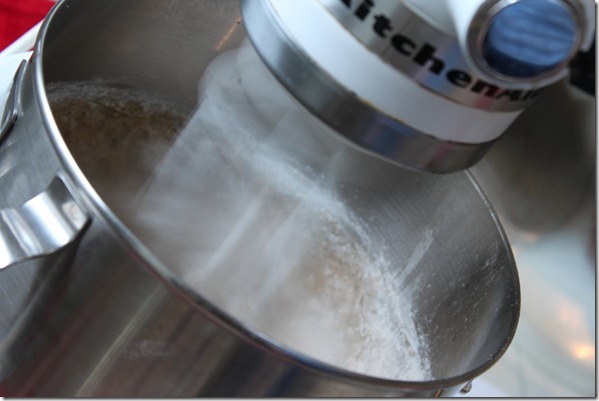 On low speed, add the flour mixture in three additions, alternating with two additions of hot water. Mix over low speed until the flour is just incorporated (avoid over mixing). Pour the batter into the greased loaf pan and smooth the top. Bake at 350 degrees for 60-70 minutes or until a toothpick inserted in the center comes out clean. Allow the bread to cool in the pan, on a cooling rack for 5 to 10 minutes, before removing from pan. Allow the bread to cool completely before serving. Obviously, this banana bread tastes great the day of baking, but I actually prefer how it tastes the on day 2, when the flavors settle and become more pronounced. Bread can be wrapped well and stored at room temperature for up to 3 days.